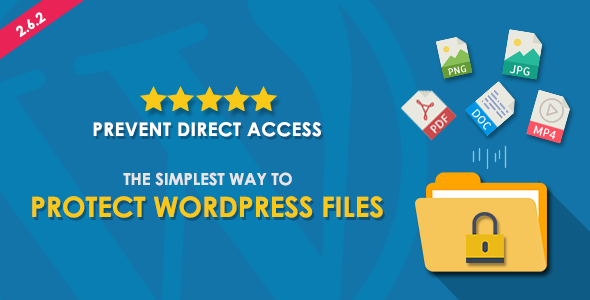 Prevent Direct Access provides a simple and easy way to protect WordPress files. Seamlessly integrated, you can now easily protect your WordPress Files by just one single click. Once protected, they cannot be accessed directly through their original, unprotected links (URLs). Unwanted users will be redirected to your 404 error page when attempting to view these files directly. Instead, our plugin will automatically generate random Private URLs or you can just create and customize your own ones. These private URLs are the ONLY way to access your protected files. Prevent Direct Access Gold protects unlimited WordPress files and all file types including PNG, JPEG, ZIPs, PDFs and MP4 that you upload to your WordPress Media, Pages or Posts. Once protected, they cannot be accessed directly via their original URLs. Prevent Direct Access plugin explicitly tells Google and other search engines not to index any of your protected content so that your protected files and their original URLs won’t be indexed nor appear on the search results. Prevent Direct Access allows some specific roles of your website such as your subscribers and contributors to access your WordPress protected files. This feature comes in handy when you have a membership platform in place where you want to protect your files, and at the same time, allow your members to access those private files. You can also keep track of clicks on any private links.